The “Roman Iron Age” in Denmark, the years 0 – 450 AD, has traditionally been largely overshadowed by the Viking period from 900 – 1200 AD. And to many Danes this “Roman era” is still a dark chapter in the Danish history. Many finds in Denmark are from this period. But it is worth mentioning that many of the discoveries, especially from the first and second Century, are gravefinds and finds of Roman goods that clearly have been cherished by their owners. They are not prizes of war, but goods that have been traded and perhaps given to their owners. Things that appearantly show, that the danish tribes in this age, had a friendly and close relationship with Rome. A friendship wich counted trading and a wide support from the tribes to the Romans. A support that also encounted danish tribesmen participating in the Roman wars against other Germanic tribes, probably as "Auxillia" (supporting troops) or, in the later periods, as regular soldiers in the Roman Army. But there it is even the possibility that in southern Denmark the Romans created a "Client State" (or more), mainly in the islands between Jutland and southern Sweden. Actually some historians & archeologists think that they existed (at least one related to the "Himlingoje Dynasty" in the southern area of the Zealand island) until the second century and perhaps until Marcus Aurelius. Indeed Danish archaeologists: Lars Jørgensen, Birger Storgaard and Ulla Lund Hansen have suggested Germano-Roman alliances, in which Romans supported a Germanic power in today's Denmark. According to Jørgensen, this was either to destabilize Scandinavia, or to create a Roman friendly power which could help ensure peace and stability in the border areas. Ulla Lund Hansen and Birger Storgaard have also suggested that Roman interests in Scandinavia were strong since just before Augustus times, and that there was direct contact. Storgaard alluded to a text written in accordance with an expedition led by Tiberius in year 5 AD, in which Tiberius describes what has been interpreted to be Jutland, although this interpretation is based on myth. Jørgensen points to the Gudme-Lundeborg complex in Fyn, a Denmark's island. Archaeologists have found Roman coins and scrapmetal at Lundeborg, a trading place in relation to this complex. Hansen, Jørgensen and Storgaard interprets from these archaeological discoveries that Lundeborg may have functioned as a Roman port. Recently in 2014 Ulla Lund Hansen has written that has been discovered a nice bronze brooch in the island of Bornholm, located in the middle of the Baltic sea and not far from the Poland coast. It was found at the ancient village of "Lavegaard", during the excavation of a Roman settlement on the island of Bornholm. She wrote that "Larger excavation is underway, revealing an AFFLUENT ROMAN SOCIETY...and the archaeologists hope to uncover many well-preserved remnants of this ancient community called Lavegaard.Besides the owl brooch, the archaeologists have found pottery and ancient building materials, postholes marking the sites of ancient houses, along with architectural features such as ovens and hearths (and a cemetery). All evidence of industry in the form of iron smelting or iron extraction and ceramics firing, and several well-preserved metal objects are also preserved...The excavated area now totals more than 5000 m² and so is part of a much larger settlement, which in Roman times would have had direct access to the sea via an inlet, now a wetland located just south of the settlement.In fact, all the evidence suggests that Lavegaard was a rather affluent society in its day. With easy access to the sea and evidence of industry and coins (dating to AD 161-175) at the site, the inhabitants of Lavegaard could presumably afford to buy and produce valuable jewellery and other objects". (read more at sciencenordic.com/ancient-roman-artifact-found-danish-island ). "....From the first century AD a lot of interesting finds have been found in Denmark. Roman sources tell that general Silius Caecina Largus took command of the Rhine Army in the years after Quintillius Varus. One of his assignments was to find new allies in Germania, that could help him find the lost legions. In Hoby on the isle of Falster a very fine collection of roman dishes and siver drinking cups with the name ”SILIUS” engraved in the bottom, has been found in a noblemans grave. In this region, parts of a roman Cline – a roman bed – was also found. In Horsens, a roman dagger – a Pugio – and several other parts of what perhaps have been a Roman Centurions uniform, have been found. Among these also a high quality riveted Roman ”Hamata” – mail armour. In Vimose at Odense a large number of roman artifacts has been found. Among these roman 1st century gladii and a griffon from a gladiators helmet. In Gudme on Funen several treasures of roman coins, dishes and more has been found. And Actually in Denmark, no local museum is without roman artifacts found in 1st century graves.....How have all these artifacts gotten here? Are the silver cups from Hoby a gift from Silius Largus to the local prince? Is the ”Centurion” from horsens a local tribesman who had served The Roman Legions and was buried (burned) in his roman uniform? Or are there artifacts in fact spoils of war? The finds of Gudme could find its cause in the ancient trading place Lundeborg on the southcoast of Funen, where also roman merchants could have traded. A lot of roman coins have been found in the soil here..."
On “Monumentum Acyranum”, Augustus own descriptions of his deeds, it is told that in the year 5 AD he sent Tiberius on a major clearing expedition to the most northern parts of Germania. With a fleet from the Rhine and possibly a supporting land-army he advanced to the Cimbrian Peninsula, and made peace agreements with the local tribes there. This first official contact with the “Danes”, since the Cimbrian and Teutonian migrations in 150 BC shows that there appearantly was an active interest in Rome in an annexation of the southern parts of Scandinavia into the Roman Empire. However we must remember that the names “Danes” and “Denmark” first appeared in 800 AD; and before that a multitude of tribal names was used for the citizens of the Cimbrian Peninsula and the Danish Isles: among these tribes were the Teutones and Cimbrians, names that still is found in present day places like “Thy” (Teuto) and “Himmerland” (Cimberland), both locations in Jutland. In the following years the supporting land-army probably reached the Baltic sea and the Jutland peninsula. But the navy expedition for sure reached the actual Poland and eastern Sweden coast, and made agreements with the inhabitants of the Danish islands: these agreement usually were more that simple trade pacts and dealt even with the creation of a "Client State" (as happened in other border areas of the Roman empire, like in the northern Black sea or in actual Morocco). The mission for Varus was to prepare the advance of the Imperial border to the River Elba. But after this major loss, the Romans resignated and gave up any further offensives beyond the Rhine, and the northern border of the Empire stayed at the Rhine. Though the plans for the northern germanic territories were abandoned by the Romans, it seems that a broad contact were established between the Romans and the tribes of Southern Scandinavia. Especially famous is the trading expeditions to the Baltic for "Amber" to ornate the Emperor Neros palace after the burning of Rome in 64 AD. This palace was later demolished by Vespasian, and he and his sons Titus and Domitian erected the Colloseum at its place. Furthermore, it is noteworthy to pinpoint that Roman merchants also traded with southern Sweden and the Öland island was a trading outpost, according to recent archaeological discoveries. The Romans who travelled north for ‘the gold of the Baltic’ (as was called the "Amber") would take with them various items to be traded, including fabrics, ceramics, metal objects, trinkets, wool, as well as bronze and brass artefacts. They brought back sacks of amber, animal skins, wax, feathers and beaver coats. Due to increasing intense economic contacts, Roman coins also were started to be used (nearly one thousand "solidii" -from the fourth and fifth centuries AD- have been found in the southern Scandinavia region, read numismatics.org/digitallibrary/ark:/53695/nnan59692), but actually there it is not a huge research by academics on this matter. However, there are some interesting studies in the last years about the so called "Sweden's Pompeii": Sandby borg in the island of Öland (if interested read researchomnia.blogspot.com/2018/08/the-pompeii-of-sweden.html). The archeological discoveries in Denmark from this period are really interesting. Especially the great gravefinds from Himlingoje on Southern Zealand, Gudme on Funen and the rich Hoby graves from Lolland. In these large finds, a wide range of Roman officers equipment were found. And especially two Silver Cups from Hoby are of great interest. Not only because of their superb quality, but also because of the name “Silius” wich is ingraved in the buttom of the Cups. If Silius is the former owner of the Hoby Cups, the idea that danish tribes were hired as "Auxilia" to the Romans seems obvious. Wich also explains the many other finds of Roman military equipment in Denmark from this period. For instance a beautyful 1st Century Pugio found in a grave near Horsens in Jutland. Together with this Pugio, there were found also a Roman style Hamata and a Roman military Balteus and other personal equipment. A discovery that appearantly show the presence of Roman military activities in Denmark, or “Danes” that served with the Roman Army. Findings all over Southern Scandinavia, of especially Fibulas, indicates that a small “Empire” (or "Client State") was present here in the first and second Century. With a “Himlingoje Dynasty” as rulers. This “Dynasty” not only traded with Rome, but appearantly also lived a very “Roman” style of life. If there were such an “Empire”, it is obvious that the Romans could benefit from this State, and seek alliances with this regime. Alliances that today is described by historians as Denmark beeing a “Client State” of Rome: it was a supportive territory for the Romans where they traded and recruited Auxilia and soldiers for the wars down South. Dr Harry Sidebotom wrote in the September 2014 "BBC History" edition that "Recent archaeological studies offer a potentially new and important insight. From AD 162–80 Rome was embroiled in the Marcomannic wars against the peoples across the upper waters of the Rhine and Danube. From this period, finds in Scandinavia begin to increase both in wealth and in the numbers of Roman imports, including swords. The epicentre was the burial site at Himlingoje on the Danish island of Zealand.The spread of artefacts, especially elaborate brooches (rosette fibulae), from Himlingoje to other sites in modern Scandinavia, Poland, and the Baltic countries suggests the appearance of a large political unit around the shores of the Baltic Sea. It has been argued that Rome employed diplomatic gifts and the supply of weapons to create an extensive CLIENT KINGDOM beyond the Marcomanni and its other enemies. Not only could the new power based at Himlingoje threaten the rear of Rome’s enemies, but it could supply new reserves of mercenaries. If the hypothesis is correct, the new extended political organisation could have acted as a model for the soon-to-emerge confederations of northern barbaricum.The leaders of the Franks, Alamanni and Goths could have learnt from the royal dynasty of Himlingoje. In the north, as in the east, by different processes, but to the same result, Rome had assisted in the creation of enemies much more dangerous to its own empire." Additionally, chiefdoms like those in the islands of Lolland and Falster were based upon what is commonly called a prestige-goods economy.Prestige goods are nonutilitarian objects that are indispensable for social and political relations—in this case, Roman imports of weapons, ornaments, and feasting and drinking equipment. In return, the Romans received leather, fur, meat, cloth, and probably slaves. In Denmark, personal reputation and power were intertwined with the ability and degree to which one could control and own Roman goods, a system that only worked if their flow was controlled by an elite minority. In return for sharing prestige goods with lower-level elites for their own legitimation, chiefs received staple tribute: livestock, grain, and other supplies. Lower-level elite in turn extracted tribute from farmers in return for their services in defense, upholding law, and overseeing ritual activities. Grave goods reflect this hierarchy: a few have the full complement of prestige items, others less but still rich, while many have small quantities of less valuable Roman items. War chiefs had much power within society but were balanced by the thing, a regular meeting of freemen—and possibly some women, if we infer from some later sources—who could vote against the plans of chiefs. In addition, a chief's son was not automatically a chief; all contenders had to prove themselves, leading to a degree of upward mobility in society. Furthermore, in order to maintain a certain degree of stability among the barbarians that lived on the borders of the Roman Empire and beyond, the Romans developed a series of procedures. They bought off the native élite with luxury goods and money. They could also offer special monopoly or protection and in some cases the élite’s young could be fostered in the Roman Empire. Sometimes they were even fostered in the Emperor’s household to later on return to their tribes, and now behaved more Roman than many Romans themselves. Hints of the gift-giving are found in Lolland, Denmark where silver cups and a bronze vessel were found. The silver-cups showed scenes from Classical scenes like the Iliad. It is interesting that in the first centuries AD Lolland and Eastern Fyn, Denmark have inhumation graves that are rich in Roman goods, but does not contain weapons. On the other hand graves containing weapons are poor in Roman goods. This distinction is also evident in Southern Jutland, Denmark, whereas Eastern Jutland does not have this distinction. Eastern Jutland do not show graves that contain much Roman goods, but instead show a mix of rich and poor burial findings. From around 150 AD and onwards Roman imports seem to have been sent to a site at Stevns/Himlingøje in Sjælland (Zealand in Danish language)), Denmark. The best quality materials apparently stayed there, while the rest might have been shipped off to other areas. Other important areas are Sorte Muld on Bornholm, Denmark and Bejsebakken in Ålborg, Jutland. The Stevns/Himlingøje-centre was surpassed by Gudme on the island of Fyn by the end of the third century. 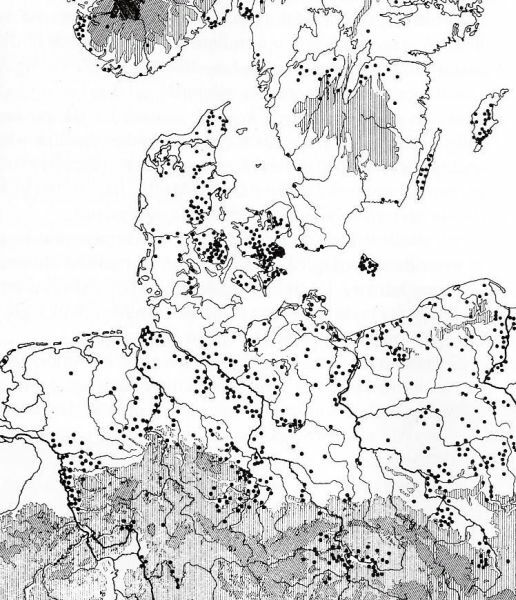 Archaeological evidence from Denmark demonstrates that particular clusters of elites in various periods controlled the trade with the Romans( read: "Political complexity in Denmark during the Roman Iron Age" pag 27.) The earliest concentration of Roman goods occurred in high burials in Lolland dating to the 1st and 2nd centuries AD. In the early period of trade, the goods entered the north when Roman messengers entered Denmark to give the elite class gifts and elaborate items. Not until later (after Augustus) did a limited number of local rulers (of the "Client States") organized the importation of Roman goods. In the 3rd century AD, the elite on Sjælland controlled trade via a sea route to the mouth of the Rhine that bypassed continental land routes. Like Sjælland, most islands between Jutland and Southern Sweden assumed power with the help of the archipelagic nature of Denmark. Beginning in the middle of the 3rd century AD, eastern Fyn controlled trade, primarily because it could easily trade with water traffic and merchants from Roman provinces. In the 4th century AD and continuing, Jutland had the greatest contact with the Roman Empire. Jutlands increased interactions with the Romans probably occurred because the Ox or Army Road ran through the narrow isthmus of the southern part of the region. Viking Age documents described "Ox Road" as a corridor that allowed traders and travelers to move easily between the continent and Denmark. As "Client States" the tribes north of the Danube had traditionally been a very peaceful territory for the Romans. But in the 150’s this area was destabilized by a range of migrations from the north, pressing the Marcomanians, the Quades and the Sarmatians downwards against the Roman Danube border in the present Czech Republic. Regular wars between some of these tribes and the Romans broke out in the year 166 AD, in the fifth year of Marcus Aurelius as Emperor. And they didn’t end before 180, in the time of Commodus. Today there is no doubt, that also South Scandinavians participated in these wars. Gravefinds from Müsov in Mähren indicate this, with the findings of jewelry and fibulas that are obvious Scandinavian. And in Himlingoje two Roman silvercups, showing Roman soldiers with “Ringgrib” swords, were found. These Roman Gladii had their prime in the Marcomanian Wars. Also the discovery of a gold Kolb Torch in Himlingoje is evidence of a “Danish” participation. The Kolb Torch were a sign of dignity among the Sarmatians and the Sarmatians participated in the wars on the Roman side. Wich clearly indicates, that also the “danish troops” were on the Roman side. That the Roman – South Scandinavian relationship were well established and continued on to the 5th century is indicated by the many findings from this period. Most of all by the great "Bog-finds" from 300 – 500 AD. Among these is the Illerup findings and the Thorsbjerg findings, which counts as the largest finds of Roman weapons in the World. These weapons were not in use by the Romans themselves, but were blades produced in Roman Fabricas and purchased by the Scandinavians in the Roman Empire. That Roman Merchants sailed the waters of South Scandinavia for several centuries are clear. Worth mentioning are the Egyptian Geografer Klaudios Ptolemaios travel descriptions from the second century, wich describes the naval route from the Rhine around Jutland and through the Danish sea of Isles to the coast of Poland. A route, also described by many other Roman authors, like Tacitus. A route appearantly commonly used by the Romans. It appears, by the writings of Marcus Aurelius, that it was his plan to establish two new provinces north of the Danube. The provinces "Marcomannia" and "Sarmatia". And thus, push the border of the Roman Empire to the Baltic. In such an enterprise, the Romans would have to have good and loyal “Clients” in South Scandinavia, in the ”Danish territories”. And it now clearly appears that they had just that. When Rome fell in the mid-fifth century, so did the Danish prestige economy, but most of Denmark's small realms did not collapse: they reorganized and expanded. A few groups found themselves in disarray and sought new lands, leading to what is called the Migration period, when Langobards, Teutons, and other "Danish" tribes overran the Roman Continent and staked a claim. Despite this, around A.D. 550, Gothic writings indicate that many small polities in Denmark were being consolidated into bigger political units: evidently, some of the former "Roman client States" in southern Denmark started to grow and to be the political entities of medieval Denmark. Very good article. And very interesting. Germania (Roman province) was a short-lived province of the Roman Empire created temporarily by Augustus when he unsuccessfully tried to conquer Germania Magna. It lasted from 7 BC until the Battle of Teutoburg Forest in AD 9. The capital was Aliso (modern Haltern). Initially the Romans -with Julius Caesar leadership- conquered the area west of the Rhine river, but soon started to conquer the territories to the east, beyond the Rhine. Between 10 BC and 6 AD the future emperor Tiberius, his brother Drusus, Lucius Domitius Ahenobarbus, and Germanicus conducted long campaigns in Germania, the area north of the Upper Danube and east of the Rhine, in an attempt at achieving a further major expansion of the Roman Empire together with a shortening of its frontier line. They subdued several Germanic tribes (making also alliance with tribes, like the Semnones, living near the Oder river). Lucius Domitius Ahenobarbus was the successor of Tiberius and the first military "governor" in Germania , where he commanded the Roman army and crossed the Elbe, during which he set up an altar to Augustus (probably in the western area of Brandenburg), and penetrated further into the country than any of his predecessors had done. He also built a walkway, called the pontes longi, over the marshes between the Rhine River and the Ems River. For these achievements he received the insignia of a triumph. In 6 AD, Tiberius declared Germany pacified and Varus was officially appointed to govern Germania (after he suggested his nomination to Augustus) in the new capital Aliso. Since Theodor Mommsen, it had been assumed that Roman operations in Greater Germania were initially limited to exploratory expeditions, and small temporary trading stations. This was despite Cassius Dio's reference to the foundation of some cities during the governorship of Varus. But there were also some civilian settlements. Waldgirmes was one of these places between the Rhine and Elbe, initially established to trade with the Germanic population and to supply Roman troops. Other important settlements/fortifications (together with the capital Aliso) were at Marktbreit, Anreppen, Oberaden, Rödgen and Hedemünden. In 1985 it was discovered that not far from the Roman fortification of Marktbreit, a civilian settlement of 3000 inhabitants was established (canabae legionis) to support the camp. But it was abandoned, without destruction, around 16 AD: it is the easternmost Roman civilian settlement so far discovered in central Germany. The Roman plan to complete the conquest and incorporate all of "Magna Germania" into the Roman Empire was frustrated when Roman troops were defeated by the German tribesmen in the Battle of the Teutoburg Forest in 9 AD. This historical defeat was followed by a nearly complete sweep of all Roman forts, garrisons and cities (of which there were at least three) east of the Rhine; the remaining two Roman legions in Germania, commanded by Varus' nephew Lucius Nonius Asprenas, were able to hold the Rhine. The province's main fort, "Aliso", located in today's Haltern am See, fended off the Germanic tribes for many weeks, perhaps even a few months. After the situation became untenable, the garrison under Lucius Caedicius, accompanied by survivors of the Teutoburg Forest and civilians of the canabae vicus, broke through the siege, and reached the Rhine. Augustus then ordered Roman withdrawal from the remaining occupied territories of the former Roman province of Germania (completed by AD 16) and established the boundaries of the Roman Empire as the Rhine and the Danube. The only areas of the short-lived Roman province of Germania that successively remained inside the Roman empire -after the Augustus order to withdraw west of the Rhine river- were the Agri Decumates. 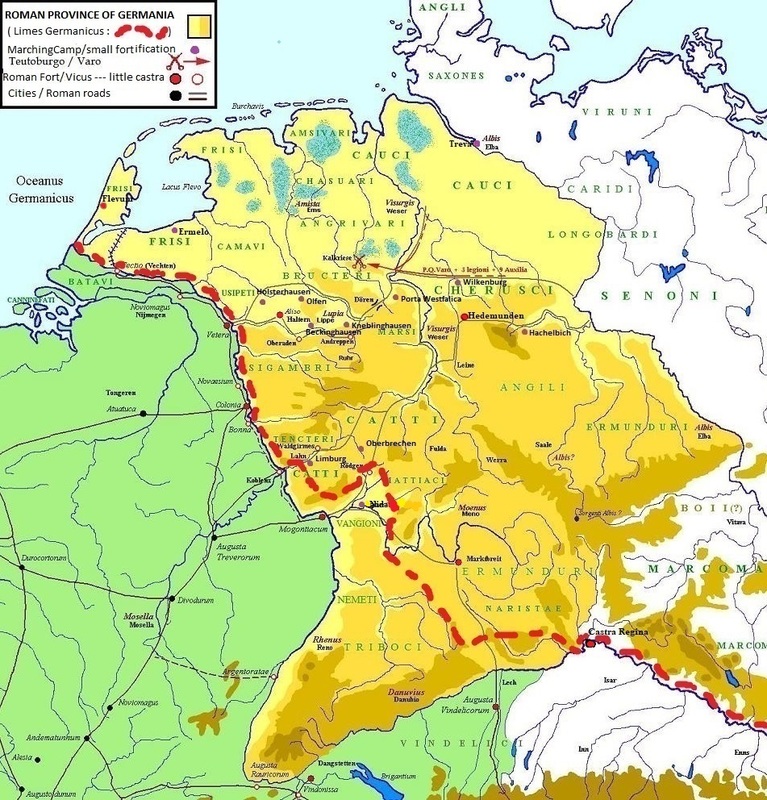 Even if reconquered temporarily by Germanicus in 14 AD and 2 years later abandoned, under the Flavian emperors Romans took control and settled again this region: the Agri Decumates were part of the Germania Superior province since 85 AD. The legionaries built a road network for military communications and movements, and improved protection from invading German tribes (who used the re-entrant region to penetrate into Roman Gaul provinces). Frontier fortifications (Limes) were constructed along a line running Rheinbrohl—Arnsburg—Inheiden—Schierenhof—Gunzenhausen—Pförring (called Limes Germanicus). The larger Roman settlements in the Agri Decumates were Sumolecenna (Rottenburg am Neckar), Civitas Aurelia Aquensis (Baden-Baden), Lopodunum (Ladenburg) and Arae Flaviae (Rottweil). Romans controlled the Agri Decumates region until the mid-3rd century, when the emperor Gallienus (259-260 AD) evacuated it before the invading Alemanni Later the emperor Aurelian (270-275 AD) had the region briefly reoccupied during the Roman resurgence of the late 3rd century under the so-called "military" emperors. I would like to comment, that large parts of this article is written by me! ...for our group brochure and homepage www.legionord.org. So please, Show some respect for your sources and add Credits. Especially when you copy - paste!